Single Table strategy is the simplest and typically the best performing solution. By this inheritance strategy, we can map the whole hierarchy through a single table. The table will have a column for every attribute of every class in the hierarchy and an extra column (also known as discriminator column) is created in the table to identify the class. Now suppose you want to map the whole hierarchy given below into a coherent relational database schema. 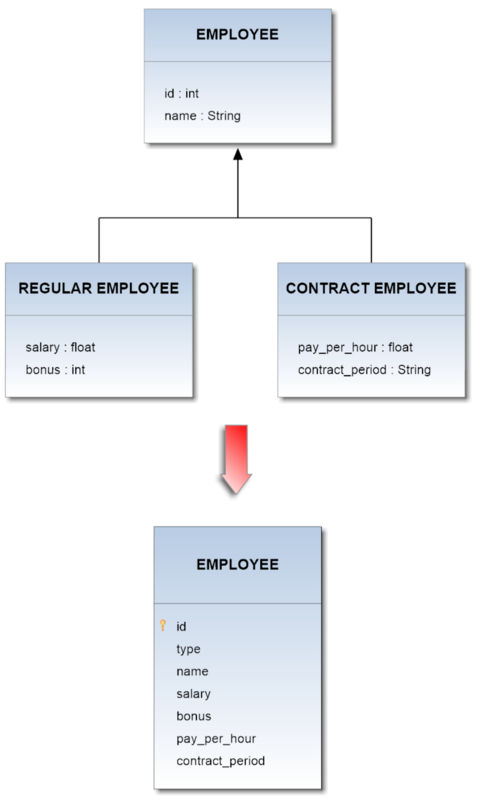 The Employee class is a superclass both for Regular_Employee and Contract_Employee classes. The type attribute acts as discriminator column.